Minnesota Twins announce they have come to an agreement with RHP Nick Blackburn on a 4-year, $14 million contract with an option for 2014. Sometimes you need to make a move for more than just financial reasons. Sometimes you do it to avoid risk, or to put your team in a position to compete. Sometimes you do it to go that extra mile, or to signal to the league or your fan base that things have changed. And sometimes you do it because you just plain like a player and what he's done. This should NOT have been one of those times. I think it's fair to say, among the sabremetric set, I'm one of Blackburn's biggest believers. His critics throw the word "lucky" around a lot. They point to his low strikeout ratio, his high hit rate, and his mediocre groundball percentage. They look at his 4ish ERA and claim it will almost undoubtedly move the wrong way. They emphatically state that his luck is going to end. And to that I say: so what? All of our luck is going to end. If he was lucky last year, and he was lucky the year before, who is to say that he won't be lucky again next year, and the next year, and the next? The game is a game. There are infinite ways to play and win. We get so caught up in our own ability to identify the prototypical high upside power pitcher that we don't appreciate a guy who gets it done any other way. And Blackburn has unquestionably gotten the job done over the last two years, legitimately being the Twins best starting pitcher over that stretch. We should be celebrating this, not dreading the end of it. So, to recap - I'm a Blackburn bobo. And I still don't like this deal. To understand why, we need to understand the other option the Twins had. Blackburn is under their control for the next four years, regardless of whether they signed this deal or not. This year they could pay him whatever they wished. 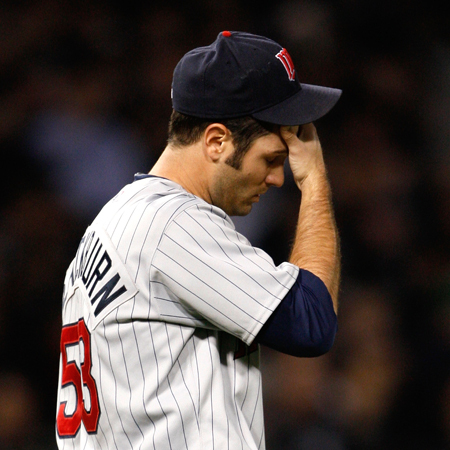 For each of the next three years, the Twins could have decided whether to offer arbitration to Blackburn, and then he would have been paid fair market value for a pitcher with his tenure and performance. Which gets us back to why you do a deal like this. It has nothing to do with the guy, or the position your team is in, or sending signals to anyone. It only has to do with one thing: money. Assuming the Twins were going to pay Blackburn for at least the next two years, they are risking about $10 million to potentially save about $4 million. I just don't think you can do that with a low strikeout pitcher. There's too much evidence that they aren't effective for a very long time. And the Twins should KNOW this. They've done it twice recently. The first time was disastrous and the second time worked out better because the contract was shorter. The shorter contract was with Carlos Silva, who agreed to a two-year deal with a third year option. Silva was great the first year and terrible the second year. The third-year option for $4 million was cheap enough that the Twins picked it up, Silva ate 200 innings with a 4.19 ERA and then signed his current deal with the Mariners. That worked out because the option year was just three years out. Over the next four years, Mays pitched less than 400 innings, and posted a 5.81 ERA . Mays' problems weren't necessarily related to his strikeout rate, as he struggled with injuries which included a reconstructive elbow surgery. But that's the point - there are already plenty of risks with young arms to worry about. I’m a Twins fan, and I hope I’m wrong about this. I hope Nick has a long and prosperous career. I hope executives in baseball circles laud Bill Smith for years to come. I even hope Jim Pohlad saves millions of dollars over the life of this contract. But from an impartial observer this looks like a $14M gamble on a somewhat questionable commodity that the Twins didn’t need to do. Absolutely right. No knock against Blackburn, but a mid-market team that's about to get hampered with a grossly large longterm contract can't be throwing money around to just anyone. The Twins have been fiscally responsible almost to a fault (miserly?) and all of a sudden they guarantee money that they don't need to guarantee for a long while? I'd say Span and Slowey and possibly even Liriano depending on his year are much more pressing contracts than Blackburn. Players with roughly the same career xFIP as Nick Blackburn: Jered Weaver, Matt Garza, John Danks. I think this is much ado about nothing. Blackburn needs to produce 6 WAR in 2011, 12, 13 for this to be a breakeven deal. He's probably got a range of 3 to 9 WAR for that time period. Worst case they overspend by $7M. Best case they save $7M. no, the worst case is he gets hurt tomorrow and never pitches again. Second worst case is he never sees a sub 5.5 ERA again. All to maybe save a million or two three years from now. It's a gamble. I think they just saw that he's been their most productive, reliable pitcher the last two years and decided he was the kind of level-headed veteran they wanted to keep around. But unless a guy has a huge, huge upside that will suddenly make him worth $10 million a year, it's weird to lock up a guy you've already got locked up the next four years anyway. Maybe it really is a message: this is the kind of guy we like, a good, stable, hard worker, plays the game the right way type, and he's an example of how to get rewarded. not getting the consternation from Twins fans on this one. Blackburn has been "lucky" 3 years in a row (AAA and two years in the majors). I'd say sample size should dictate that whatever he's doing is something he has control, and given his age, I'd guess he will maintain control over that for the bulk of his contract... quite possibly all. We just locked up an above average pitcher for 4 or 5 years at a very reasonable cost. I think this is great and helps solidify our long term competitiveness. With the young guys, you have to do this. I'm actually surprised we haven't done the same thing with Span. no, the worst case is he gets hurt tomorrow and never pitches again. This is a risk with every contract; as such, it's a moot point. Second worst case is he never sees a sub 5.5 ERA again. This is a risk that is more pertinent to Blackburn given his pitching tendencies, but is still, I think, closer in relevance to the risk that he gets hurt and never pitches again, than it is to the chance that he breaks even on/outperforms the contract. I can't decide what I think of the deal. For one, the Twins are talking about how "consistent" Blackburn is. This isn't completely true. Blackburn usually sets the world on fire through June, implodes in July and August, and regains form in September. At least, that's been the script so far. So, his season totals have been consistent, but it's not like you know what you're going to get every time he goes out there. At the same time, the fact that he's been up and down and (apparently) made adjustments mid-year gives me hope that this is a guy who works at his craft and can adjust when things aren't going to plan. Interestingly, Dave Cameron picked Blackburn as one of his "Dave's guys," as a guy who's under the radar but will probably do well. I have to agree. My faith in Blackburn is in no way based on the statistical analysis I love, but there's something about him that makes me think this will work out. My definition of Luck: Luck is 70% skill and 30% timing. Based on that definition if Blackburn has been "lucky" then it's mostly his own skill that has made him lucky. The timing part for Blackburn has been the fact that he has gotten the ball a few times late in the season when the team needed him to be lights out and he has done that. As far as the long term is concerned, the stat-heads have mentioned that he's not a power pitcher and that pitchers like that tend not to last, or sometimes they do. There was a point in time (not that long ago really) that Blackburn might be described as a "finesse pitcher". He doesn't over power you but he seems to understand his own game well enough to do better than average. Most pitchers learn this over time. If Blackburn knows this now he most likely has more long term potential than a strict power pitcher. I still think the Twins are doing this for payroll certainty in the future, so that they have a better understanding of their fiscal situation once they sign Mauer to his massive contract. But that might be reading a bit too much between the lines. David, injury IS a risk with every contract, and that's exactly why injury risk is NOT a moot point: Because the alternative was to not sign him to a contract. Twins would have had control over him for that stretch of time without the risk of committed money. Blackburn is one of the league leaders in getting people out. Last year, there were 35 pitchers who pitched over 200 innings. Blackburn was one of them. And he pitched 193 innings in 2008. The problem is that Blackburn also lead the league in hits given up. He makes up for that in part by giving up very few walks. But far from worrying about his strikeouts, its what happens when batters put the ball in play that is the real concern. Of course, Blackburn could improve. The assumption that he only has a downside is a mistake. If he continues to pitch the way he has the last couple years, that $8 million option is going to be a bargain. If he improves - its going to be a huge bargain. Right, good point. But by that logic, it seems the Twins should rarely, if ever, buy out arbitration years because the guy might get hurt. I just think injury risk gets overplayed; anyone can get hurt. Blackburn doesn't have a violent delivery, he hasn't had any injury problems in a long time, so I don't really see why injury risk is particularly relevant to Blackburn as opposed to, say, Baker's contract. I suppose the reward with Blackburn figures to be not quite as high with a similar risk, but to me there's no real reason to get overly concerned about an injury. Saying him getting hurt is moot and that we've locked up an above average pitcher is silly. He was already under team control we didnt lock anyone up. And injury is a risk with any contract but in this case its unnecessary risk as he was under team control. This is a low risk low reward contract, but dont undersell how bad this could go. Saying this wont end like carlos silva doesnt mean it wont. Injury is a real risk and needs to be considered before giving contracts. The best reason to buy arbitration years is to hedge bets; the team takes on a longer term risk of poor play or injury while the player forgos some money if he plays really well. Like ryan brauns 8 year 64 million dollar contract he signed as a rookie. Long term contract where he could get hurt in year 3 and leave the team on the hook for a lot of money but if he plays well will save the team quite a bit of money. Blackburn is not going to significantly out pitch this contract but still has the very real risk of injury and poor play. Baker was a better investment for the Twins because his upside is higher. Higher reward than Blackburn can offer, but similar risk. Fact, he's a .500 pitcher. Fact, he pitches a lot of innings. 14 mil sounds aboot (Canadian for about) right. Alright, I spoke too strongly. It's not a moot point. I get that he's not as good a pitcher as Baker, and they didn't need to sign him so maybe it was an unnecessary risk, but if he keeps producing at roughly his career pace the contract should still end up being a bargain, and as I've already said, I don't think there's any exceptional reason to fear a disastrous injury with him. The Twins did take on a risk committing the money, but they've also given themselves some cost certainty, and that seems to be a priority for them these days. I agree, it should end up being a bargain, and I'm sure the cost certainty is nice for the team. It's kind of fun to debate the merits and risks, though. One is that if Joe Mays had a high hit rate the season they handed him a contract, then every pitcher currently on the Twins has a higher hit rate. If Geek's numbers are right, the Twins saved $4 million dollars on a $14 million contract. That is not an insignificant savings. And that option year is worth a lot if he is still effective. You aren't going to find a veteran free agent with Blackburn's numbers willing to sign a one year deal at that price. All the people that believe this to be a bargain are looking at it wrong. The twins are under no obligation to pay him what hes worth or what he would make as free agent. If things go well for blackburn he might make 2 million more than this contract would pay him which might be about right as insurance in case of injury. More than likely blackburns actual performance is going to catch up his results and hell become less likely to earn this contract and the risk of injury will still exist. Basically what im saying is there was no reason for the twins to make this deal as it doesnt really get them anything and it locks them into some unnecessary risk. And for those who believe blackie to be a "middle of the rotation starter" and "good" need to look harder and see past his era and look at stats that are less luck based. Blackie gets more double plays than he should, has less hr hit off him than he should, stands more baserunners than he should. There is a razor thin margin between blackburns results and disaster. Likely just a matter of time. It's kind of fun to debate the merits and risks, though. And for those who believe blackie to be a "middle of the rotation starter" and "good" need to look harder and see past his era and look at stats that are less luck based. Blackburn's isn't great, but it's not bad either. Again, the contract will be a bargain if Blackburn keeps up roughly this performance. What's being overlooked here, too, is cost certainty and Mauer's (hopeful) contract. I'm sure the Twins would rather know what they'll be shilling out and take a moderate risk rather than risk have Blackburn get really lucky and go 16-6 with a 3.5 ERA this year and win 9 million in arbitration due to (largely irrelevant) focus in arbitration on wins and ERA. I don't usually comment on blogs or other people's comments but I just have to express my opinion on what Topper's comment said. First of all you said, "a mid-market team that's about to get hampered with a grossly large longterm contract can't be throwing money around to just anyone." Mid-market? The Twins are close to/ if not in the top ten in payroll AND revenue after moving into this ballpark next year. So they have the money to spend especially to a guy that has two consistent, not great, but consistent years back to back and both of those years have had very impressive showings on Blackburn's behalf. Then you said, "The Twins have been fiscally responsible almost to a fault (miserly?)" How can you say they've been they have been fiscally responsible when they gave Nick Punto a 2 year, $8 million contract after the '07 season. Do you know how ridiculous that is? Nick Punto (32) a career .248 hitter hit .228 last season and has no career accomplishments is getting paid $4 million this year. Orlando Hudson (32) a career .282 hitter who hit .283 last season, is a 4-time gold glover (4 out of the last 5 seasons), and a 2 time all-star (including last year) is getting paid $5 million. Through deductive reasoning you can conclude: 4 gold gloves, .74 points more in your career batting AVG, and 2 all-star appearances are only worth $1 million dollars in the majors. Next you went on to say, "Span and Slowey and possibly even Liriano depending on his year are much more pressing contracts than Blackburn." The first I would completely agree with you on, Span deserves a guaranteed contract just as much as anyone on the team (except Mauer), Slowey I would agree with but he's coming off of a season ending surgery so no one knows if he'll be able to regain his pin-point control which is what made him as effective as he is, but if he does I say lock him up. But Liriano? Come on man, are you serious? This guy hasn't pitched consistently well in over 3 years, and because he dominated in winter league ball which is worst then AAA ball you think he deserves a contract? Now don't get me wrong I hope Liriano regains his "Filthiano" form but he in no way deserves a contract more than a guy who Pitched 7 innings of one run ball against Detroit, the team ahead of the Twins in the division with only 6 games left to play. Then four days later, on short rest, pitched 7 innings of 2 run ball against the eventual Cy young winner in Zach Greinke in a must-win. Then Blackburn gave up only 1 run in 5.2 innings in Yankee Stadium, in the playoffs! Also let's not forget about game 163 back in 2008 when he gave up 1 run in 6.1 innings in the 1-0 heartbreaking loss to the White Sox. Also in reference to the original post, The comparisons of Blackburn to Silva and Mays aren't all that great because Blackburn has shown consistency over the past two years with the Twins where the only consistency Silva showed was when he was with the Phillies, and at that point he was a reliever, it wasn't until he came to Minnesota he became a starter and was horrible at it. As far as Mays goes he was a "flash in the pan" where he performed well for one year and showed no consistency over any back to back year period like Blackburn has done to earn a contract like this. Now I'm not trying to say people are wrong for disliking the Blackburn deal because everyone is entitled to their own opinion. Also we all share the common desire of a World Series Championship to come to Minnesota. All I'm saying is I think this was a GREAT signing. If there is a one game, must-win, I'm giving the ball to Blackburn because he has proven he can get the job done when the pressure is on, on more than one occasion. "I'm sure the Twins would rather know what they'll be shilling out and take a moderate risk rather than risk have Blackburn get really lucky and go 16-6 with a 3.5 ERA this year and win 9 million in arbitration due to (largely irrelevant) focus in arbitration on wins and ERA." Thats fair enough but if thats the case the twins would be smarter to buy arbitration from denard, slowey, delmon, liriano. Those guys are more likely to have an unexpected good year (or continue to improve in the case of denard and slowey), and put up a big arbitration number than blackie is. I think weve seen the best of nick blackburn. I alway preferred loshe to silva as a twin because he had better stuff. But luck and run support always gave silva the edge in w-l and era. It was clear that the organization and coaching staff much preferred silva to loshe because of those things and loshe clashing with gardy. Twins arent the most evolved team when it comes to statistical analysis. "Through deductive reasoning you can conclude: 4 gold gloves, .74 points more in your career batting AVG, and 2 all-star appearances are only worth $1 million dollars in the majors." That stuff isnt worth anything to me because aside from BA at that stuff is qualitative and ambiguous. Rentip you quoted punto's career numbers but the season before punto put up a rar of 25, which is higher than micheal cuddyer put up last season, and in certainly worth more than 4 million. The pro blackburn people would say that if nick punto can just put up those number the next 2 years this contract is going to be a steal. As for silva not being a good analogy to blackburn. Silva had era's of 4.22 and 3.44 his first 2 years as a twin so if anything silva was better than blackburn over a 2 season stretch. The problem with era is its exceptionally luck based, not fielding independent or park adjusted. 2 years or consistent eras is not a track record or a sign of reproducibility as era is a function of so many uncontrolled variables. ERA is not a very good statistic as far as pitcher performance evaluation is concerned. I hope no one thinks Nick Punto is a more valuable player or has been more clutch for the Twins when called upon than Blackburn, or even Cuddyer who you compared his "RAR" statistic too. To be honest you just compared Nick Punto to two of the main reasons we even made the playoffs last year. All I was saying is that Punto getting paid $4 million dollars a year cannot be justified when he's platooning with another player, or when he has the full-time job he struggles. You are paying Punto to do what a minor leaguer could do (be a utility infielder) for a league minimum contract and you could invest the money of $1-$2 million you are saving per year on Blackburn's new deal along with the $4 million Punto is stealing from the Twins to invest in a legitimate, proven, productive infielder to do what Punto clearly can't. The bottom line is, Blackburn has shown signs of being a very good pitcher and I personally believe this deal will be a steal when all is said and done. I'm not saying he's a Cy young contender I'm just saying if he keeps up what he's been doing it will be worth it. But then again who knows I could be dead wrong. When 'advanced statistics' lead you to a conclusion that 2008 Nick Punto was more valuable than 2009 Michael Cuddyer, it's time to start questioning the advanced statistics. Micheal cuddyer plays delmon young like defense according to UZR which is a component in rar. While i dont think hes that bad and right field at the metro dome poses some uzr quirks, cuddyer is definitely a below average defensive player. Defense is actually a large portion of a players value. 2008 nick punto was an above average player. Really? Defense is part of a player's value? You needed Dave Cameron to tell you that to finally believe it? When Gardy said it a couple years ago, the Stathead community laughed at him. By the way, I'm fully aware of what RAR is, and what goes into it. It's laughable how the stathead community ignored defense for years, then the Mariners trade for a good centerfielder, have a decent year, Dave Cameron has a hard on, and suddenly defense is all the rage. You seem to be waffleing. Was 08 Punto more valuable than 09 Cuddyer or not? Can we trust UZR, or does right field pose some 'quirks'? And if so, why would we trust what it purports to say about any other player? Haha. I never waffled on my opinion or actually stated my opinion. I just interrupted the statistic. I dont believe uzr is a particularly precise statistic but i do believe its directionaly accurate, certainly has comparative value and is a serviceable defensive metric. While i dont put much stock in the numeric value of cuddys -22 uzr last year because of the "quirks" in right field, the sample size limitation of a single year sample and the bias' of the stat, it does allow me to say cuddy is likely a bad defensive right fielder and certainly below average. By that same token i can say the 2008 nick punto is at least an average SS defensively. So the question is whether i would rather have an average defensive SS with an OBP heavy .726 ops or a bad defensive corner OF with a Slug heavy .861 OPS. Cuddy had a wOBA of .370 while puntos was .334. Id say their values are pretty similar but would probably take punto because of my preference for OBP and the fact that bad defensive corner outfielders that can hit are not particular rare while solid SS are. So in this case I'd say RAR did a fine job comparing the 2 players. bad defensive corner outfielders that can hit are not particular rare while solid SS are. So in this case I'd say RAR did a fine job comparing the 2 players. That'd be a fine fairy tale even if your facts were accurate, but they're not...Punto played only 61 games at SS in 2008. And his OPS there was .691, not .726. That OBP was .339, lower than Cuddyer 2009. Seems to me, by your own wishy-washy endorsement of UZR, there's only one third of a season's data there. Not to mention, if Punto's so 'solid' why couldn't he hold the SS job in 2009? 382/.726. That was his hitting line, I dont care what positions he accumulated those numbers. Michael Cuddyer RF UZR (2002-2009): -2, -3.7, -.8, -4.6, -4.5, -5.6, -16.9 (corresponding uzr/150: -18.3, -61.3, -21.1, -5.4, -5.3, -13.4, -21.2). Is this a big enough sample size for you? And youll notice that all of cuddys uzrs are negative and all of puntos are positive. Ill be less wishywashy with this endorsement (albeit no less qualitative); nick punto is a good fielder, michael cuddyer is a bad fielder. Also, my analysis of uzr wasnt wishywashy, it was measured. Understanding the strengths and weaknesses of a statistic is the most important part of using that statistic properly. I dont think cuddyer is as bad of a fielder as his uzr last year indicates but i do believe hes a bad fielder and the difference between he and punto defensively is significant. You've used words like "fairy tale" "wishy-washy" and "waffling" to describe my argument in order to patronize my argument and make it seem unfounded and weak. Instead of attacking the rhetoric of my posts why not break it down yourself? Youve attacked my claims without ever giving much evidence of yours. You'd agree that that analysis is terrible but it holds a lot of the same counter arguments youve made with regards to punto vs cuddyer. I think your antipunto sentiment isnt allowing you to grasp my argument. I dont think punto is a good player. I dont think punto is a more valuable player than michael cuddyer. What im saying is that for one season nick punto was valuable and probably as valuable as career year michael cuddyer. This was more a cautionary tale about giving players with no real baseball skills contracts based on relatively small sample periods than it is about nick punto being good. "That was his hitting line, I dont care what positions he accumulated those numbers." That's odd, given your previous statement that "bad defensive corner outfielders that can hit are not particular rare while solid SS are." If you don't care what position Punto accumulated his numbers at, why do you insist he get credit for playing shortstop? Unless you're trying to cover up for forgetting (ignoring?) that Punto only played 61 games at short in 2008 and your entire argument has been shredded. I completely separate offense and defense. So i dont care what position nick punto played to put up that hitting line, just like i dont care that michael cuddyers best stretch last year came as at 1b. I dont care what denard spans line was at each of the out field positions nor do i minimize joe mauer for dhing some. The twins were completely justified giving nick punto the contract they did based on his full season hitting line and his ability to play SS, which was my point. I understand you are looking to evaluate just the season and not use to stats in a projective manner. Punto was good defensively at 2b, ss and 3b. His overall defensive year was very good. Couple that with a solid hitting line and im still taking a solid middle infielder over an average right fielder. bad defensive corner outfielders that can hit are not particular rare while solid SS are. I completely separate offense and defense. Wow, youre dumb. You hit, and you play a position. I dont think how you hit effects how you field or vice versa. How you hit, how you field and where you field all add together to make up your overall value. If michael cuddyer played SS well his value would be out of this world but instead he plays the least valuable defensive position badly. You cant be this stupid so im gonna assume you are antagonizing me at this point. Those 2 comments arent contradictory even when taken out of context.